Visions of Jesus Christ.com - Clara Jung - Stigmatist. Left is Clara Jung with stigmata bandaging/crown of thorns. Right is her grave in the cemetery of Borsbeek near Antwerp. Agnes Françoise Clara Jung was born in Antwerp, Belgium on September 15, 1887, the eighth of ten children in a wealthy family of wool merchants. And a very Catholic family, because her father, John Jung (1849-1922), had in his youth fought as papal Zouave, armed defender of the papal state at the time of the unification of Italy (1860-1870). In 1905 she graduated as a kindergarten teacher, and worked as such in the Antwerp Teirninck and Anna Adrenal Institutes. Because of her poor health she often remained absent, and eventually she was forced to give up that work. From 1918 she was bedridden and partially paralyzed: she suffered from myelitis, an inflammation of the spinal cord. 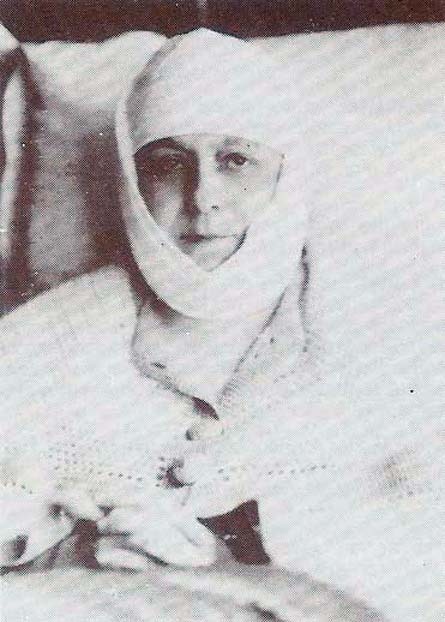 During her illness, which lasted until her death in 1952, she had reputedly several mystical experiences. These experiences were recorded by her, and by her confessor Joris Baers. She had stigmata, the external wounds of the crucified Christ. She was bleeding from palms, thighs, feet and head. Some people thought that her sisters, Clara wanted to lure customers to their textile shop. One doctor Marchal formally declared that it was impossible to detect in her the slightest trace of deception. She died in Antwerp on May 20, 1952, according to the medical report to obstruction of the esophagus. She was buried in Borsbeek on May 24, 1952. In the early seventies there was a lot to do around the recent excavation of some "stigmatized", and then it was also suggested the idea to unearth with the aim to determine whether her body intact was, and whether the body of Clara Jung was noticing possible stigmata. The excavation took place on December 14, 1976 in the presence of the medical examiner, the Borsbeeksesteenweg mayor and police chief. It turned out that the body was fairly well preserved, the heart showed a front opening, a "piercing" according to the report of the medical examiner. In 2004 it was East Priest Help/ACN temporary possessions of Clara Jung in custody, with the intention of Abbey Park in Heverlee a small museum about her in focus. But those plans proved unsuccessful. 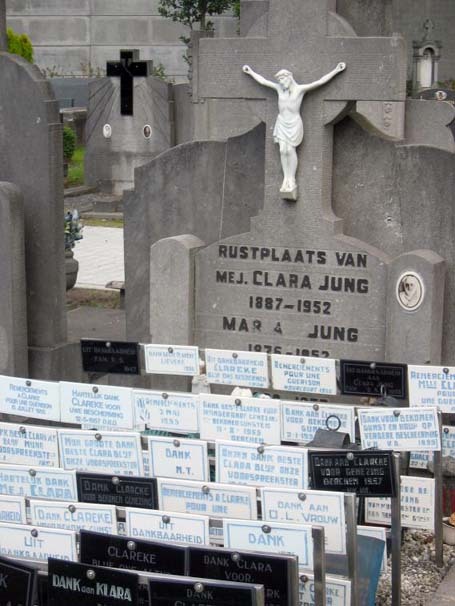 In consultation with Nulens priest, the biographer of Clara Jung, who also owns the tomb, were looking for a solution, all documents, clothing and furniture Clara Jung were transferred to French priest Degrève from Berchem for safekeeping. The interest for Clara Jung was some time ago rekindled by a book on "mystical figures and places in Flanders". The book which includes a chapter dedicated to her was written by Nicky Langley.